What's New in Version 1.15? With each new version of the Analyzer software it gets better and more feature rich, and version 1.15 is no exception! This list highlights some of the changes. For a full list of release notes click here. There is a new commercial feature for importing external data from csv files. This data is converted into zod2 files which can then be read by the Z1 Analyzer. This feature is available under File->Import External Data, or CTRL-I for a keyboard shortcut. The dialog has 3 sections. The first is where you select the file you want to import. 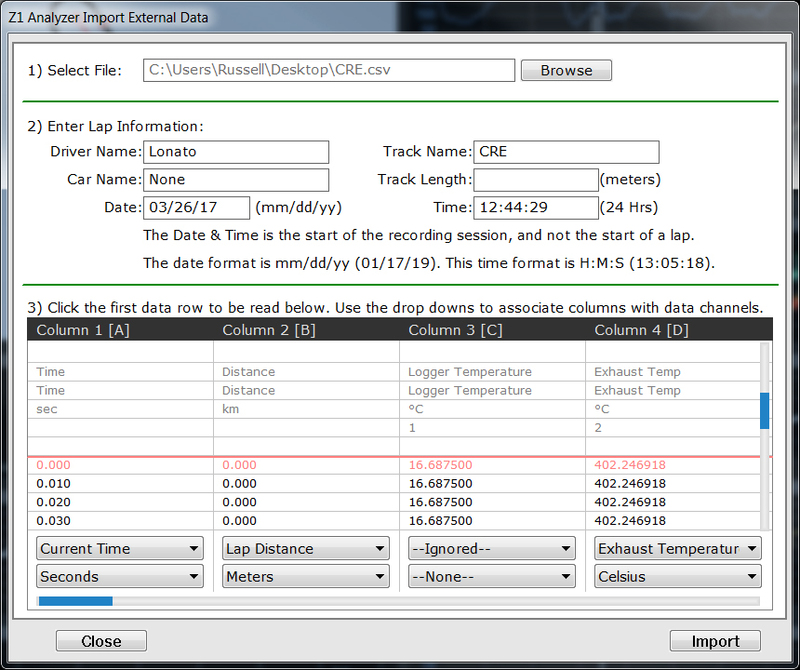 The second is where you specify information about the imported data, including the track and driver name. The third is where you map the various column in your file to data channels within the Z1 Analyzer. Once all the details are set, you click the Import button to import the data. 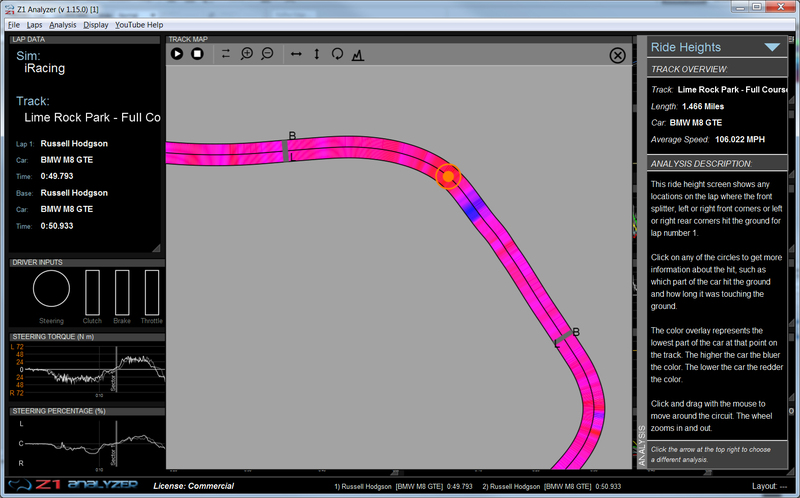 Once done you'll be able to select the lap or laps from the file. You can even compare them against laps created in a sim. Compare laps from different sims. You can now open laps from the same track from different sims. Both tracks have to have the same name for this to work. This is intended to allow you to open a lap from a sim track and compare it to a lap from an external data file (real world) track. The name of the sim and the track map data will be taken from the main lap (and not the base lap). The Ride Height Analysis screen has been updated to use the improved rendering engine that is used on the other analysis screens. It will also now show two laps side by side when you have two laps loaded. The Brake Point Analysis screen has been improved so that the act of dragging your brakes is not counted as a brake zone. We have also added comments on the overview analysis screen's braking section to include information about whether or not you are dragging your brakes during the lap. Selecting Drivers or Cars is Now Easier. The behavior of selecting drivers or cars from the popup menu in the Select Lap dialog has changed. 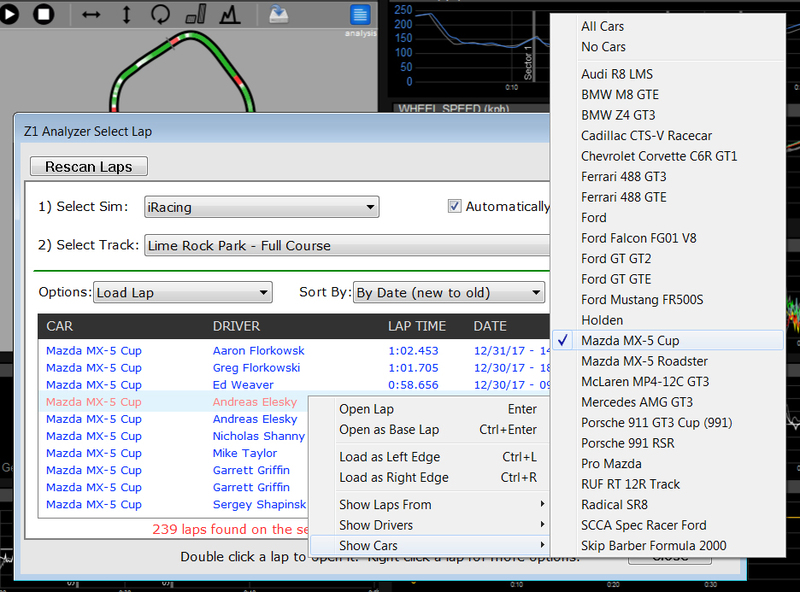 If you right click on the list of available laps you will see the standard popup menu. Selecting 'Show Drivers' or 'Show Cars' from this popup menu will display the list of all drivers or cars whose laps are displayed in the scroll window. 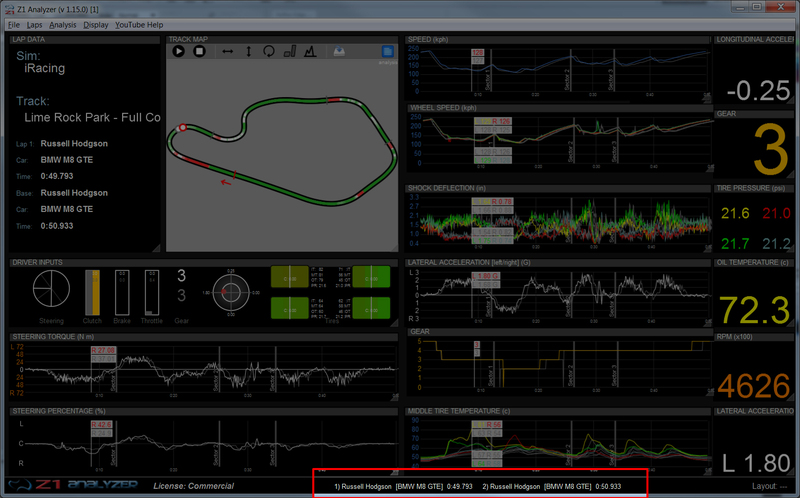 In version 1.15 of the Analyzer if all drivers or cars are displayed, as would be the case when you first choose a sim and track, when you select a driver or car name the Analyzer will display laps from only that driver or car, hiding the other laps. This is a shortcut to get the laps displayed from the desired driver or car. You can then add other drivers or cars into the mix, or display them all again if you choose. 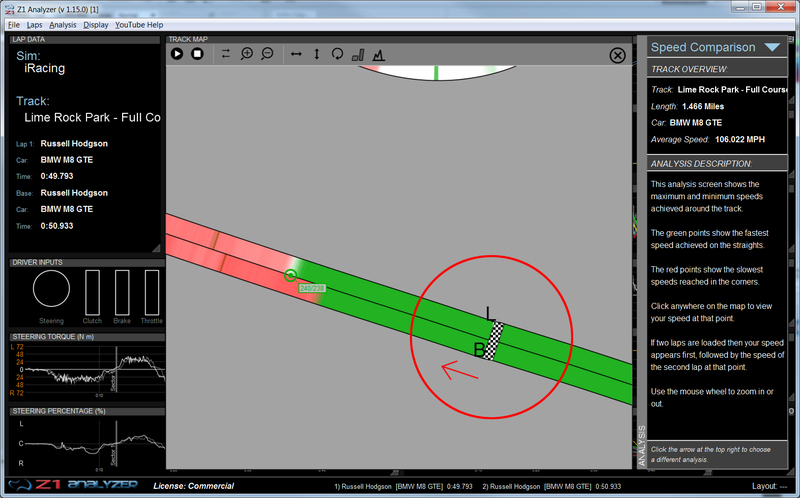 Drawing the sector line on the various analysis screen track maps has been improved to have the lines better meet the track edges. 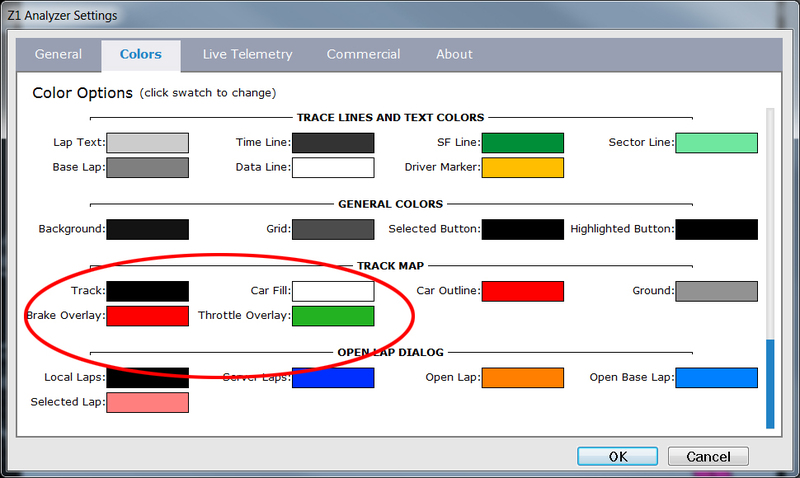 The Start/Finish line on the analysis screen track maps has been updated to be a checked flag pattern instead of a red rectangle. This makes it easier to see, especially if the color red is being used to represent data in the overlay.